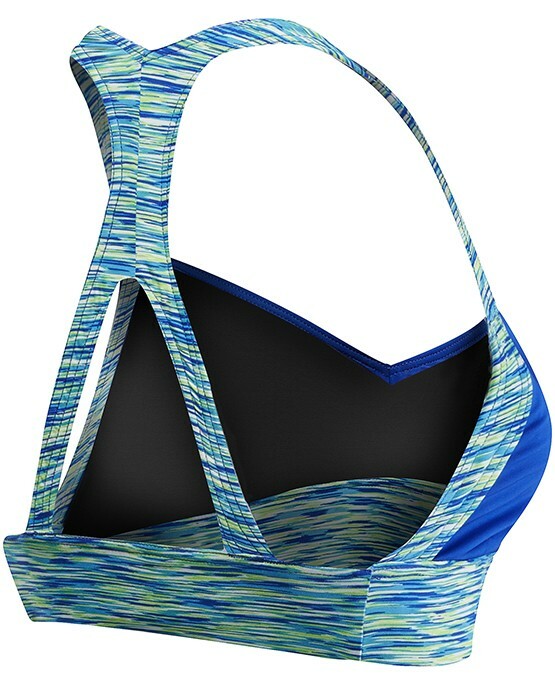 Designed for a dynamic lifestyle, the TYR Women's Isla Top - Sonoma caters to adventurists both in and out of the water. Whether it's a morning workout or a paddleboarding excursion, the BVSN7A features an ideal blend of comfort and function. With a flattering cut, moderate coverage and removable cups, this sporty bikini top is inspired by women who aren't afraid to sweat it out. Created with UPF 50+ technology, the BVSN7A provides sun safety for every outdoor activity. Bottom band folds and creases, but I love it otherwise! My first TYR swim suit lasted me for YEARS. When I was faced with buying another suit last year, I immediately chose to go with this brand again. Unfortunately this top did not live up to expectations. The first issue is the wide support band. I found that the portion under my bust would constantly fold in half. I'm forever trying to get it to dry flat. The second issue I have is the fit and proportions. I chose a small to fit my rib cage but I find that the straps are far too long for a petite frame that would fit into a small. As a result, I'm constantly pulling the front of this top up. Lastly, all of the elastic is holding up just fine (though sometimes folding in half) but after one year of limited use, the outer material is losing it's shape and is too lose for the structure which has ruined the look of the top. Oddly enough, the matching bottoms have held up just fine which makes me think this top is just poorly constructed. Q: My bust is 36 c, the rest of me is slim 510 140 size six will this top fit in a large? A: Thank you for contacting TYR Sport! We are always eager to answer any questions you have about our company. We would suggest a size Large in our Women’s Sonoma V-Neck Open Back Bikini Top. It should fit a size 36 cup well. Q: Is this pull-over top or is there a clasp(s)? Thanks! A: Thank you for contacting TYR Sport! We are always eager to answer any questions you have about our products. The Women’s Sonoma V-Neck Open Back Bikini Top does not contain a clasp, it is a pull over top with sleek fit and unrestricted movement. Q: Are the cups removeable? A: Yes, the Sonoma V-Neck Bikini features removable cups. Q: Will you'll have this in a medium soon?? Q: if my busta size its 32C, wich size should i wear?